There is a brief profile on each blog along with a link to their site. In addition to a screen shot of the site, I’ve provided few words usually edited right from their own About section. In most cases, I’ve also included their Twitter address. Shardul Mehta is a simple product guy whose passion for great products is only exceeded by his love for chicken curry. Tangible, actionable advice that you can execute on immediately. This is based on things I’ve seen work and not work. Writing about this actually sounds easier than it is. Thought provokers. Posts that push the envelope in thinking about how to conceive, validate, build and launch products. Hopefully, they will elicit discussion, debate, which can only help strengthen our field. 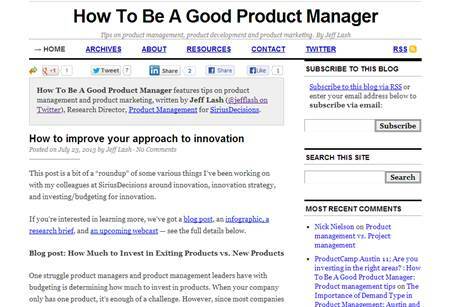 This is a blog that provides resources and tips on good product management practices. While it focuses more on managing technical and online products, most of the concepts are appropriate for broader product management purposes. Find him on Twitter at @jefflash. A blog on Product Management and Marketing Experiences, Connecting.Some.Dots was created to share Marlon’s experiences with other product managers who are working with technology and its application in order to introduce new and innovative products into the market and to sustain their success. 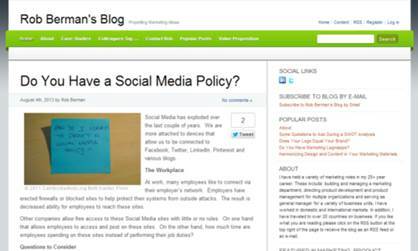 Visit Marlon’s LinkedIn profile to comment on his blog posts. 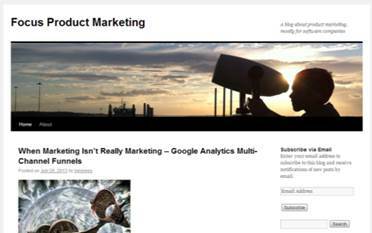 Ben Rees comes from a Product Management background but then moved over to the dark side of Product Marketing – which is the subject of this blog. Find him on Twitter at @benjrees. Cindy Alvarez is a product manager who turns understanding the customer into competitive advantage. Her philosophy is it’s all about the experience. She’s excited by companies who “get it” – that consumers don’t separate user experience from features and benefits of a product when they decide whether or not to use and recommend it. But “the experience” isn’t just about consumers – it’s a dedication to ongoing improvement in how you work together and communicate and empower your teams. Everyone has to know where we’re going in order to get there. That requires effective communication and a shared vision across multiple teams who often don’t “speak the same language”. 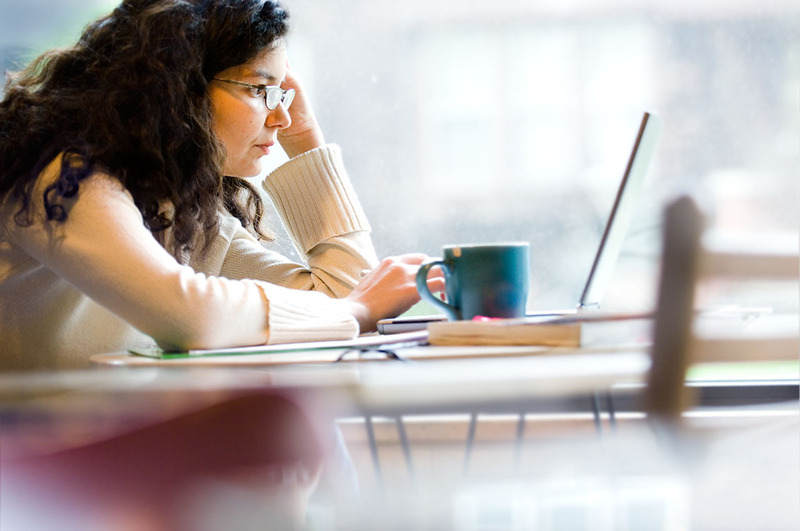 She evangelize a product experience-driven development process. Find her on Twitter at @cindyalvarez. 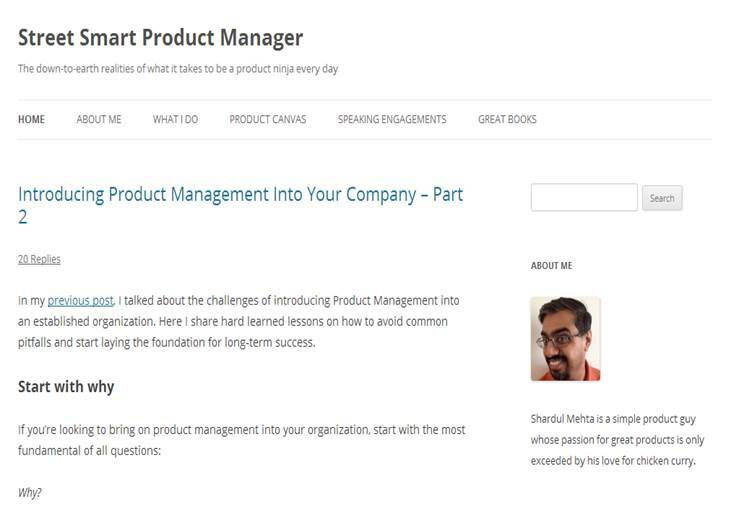 Stewart is a promoter, evangelist and recognized thought leader of product management best practices. 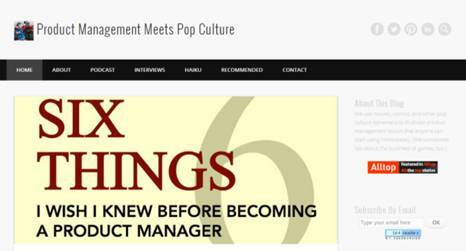 He is an experienced product management professional with over 10 years in online and technology product management. Find him on Twitter @stewartrogers. Product Management Meets Pop Culture is Chris’ attempt to give something back to the community that helped shape him as a product management professional. Why the pop culture? 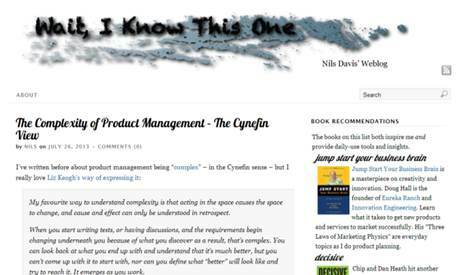 Chris developed this site — using movies, comics, and other pop culture ephemera — to illustrate product management ideas that anyone can start using immediately, and to encourage discussion of best practices that we can all benefit from. Follow him on Twitter @chriscummings01. On his blog Nils hopes to share some insights and experience he’s gained over 20 years of practicing and studying software product management. 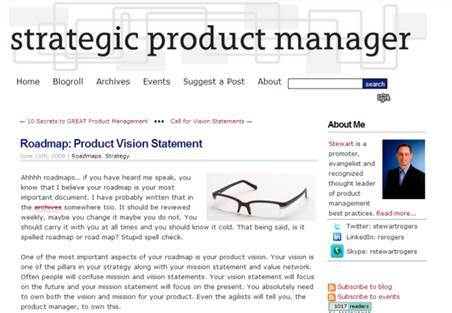 He has both a less sanguine view of product management plus a more extravagant view of its meaning. He’s most interested in the specific challenges that arise because product management is a complex domain and discipline. You can also follow him on Twitter @nilsie. Teresa is a product consultant and coach who works with early-stage companies helping them translate their big ideas into great products. Her focus is on helping product managers be better at what they do by sharing knowledge, building know-how, and refining practice. 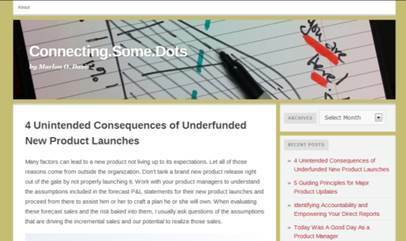 You can read more about the goal of her blog in her first post, Turning Big Ideas Into Great Products. Rob helps companies grow their revenue and profits. He created this blog to share his experiences and to engage in conversation. In particular, he leverages his experiences as a marketer, product developer and product manager who consistently brings new products to market, manages existing lines of business, drives communications and achieves financial targets. Follow him on Twitter at @rcberman. 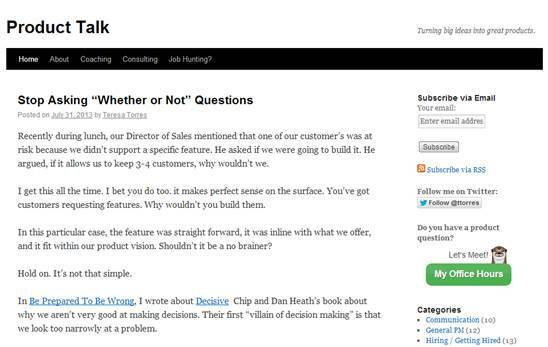 This entry was posted in Marketing, NPD, Product Marketing and tagged Chris Cummings, LinkedIn, Marlon Davis, Pragmatic Marketing, Product management, Product manager, Product marketing, Twitter. Bookmark the permalink. Thanks for the shoutout! It’s an awesome group to be a part of. Pretty prestigious company. Thanks for the mention! Thanks for including Product Talk. This is a great list. I’m honored to be included. 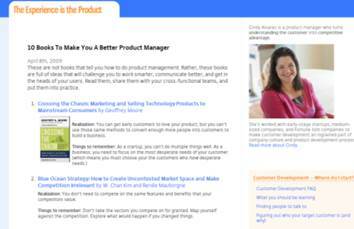 Thanks for mentioning our blog, ProductMantra. Thanks Greg. Test. Learn. Grow. Share. You are making us all better! Honored to be on the same list as some of the very folks I follow myself! Thanks! My name is Eloise. I live in Belluno Veronese, Italy. ← Are You Asking the Right Questions When Hiring a Manufacturers Representative?